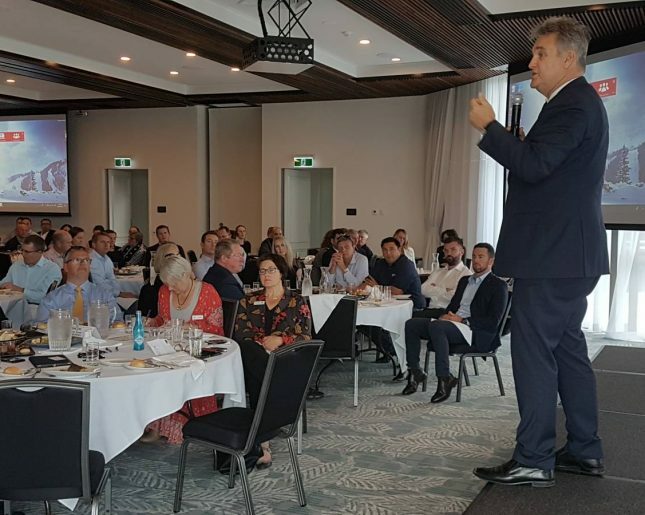 Our region is on track for a bright future, according to leading demographer and social commentator, Bernard Salt. As the guest speaker at the September 2018 Port Chamber Boardroom Lunch, Mr Salt gave comparisons of the Hastings LGA against other national and international centers with the conclusion that we are doing well, both as an economic center and as a community. The event, sponsored by NAB, Sovereign Hills/Lewis Land Group, Port Macquarie-Hastings Council and Sails Port Macquarie by Rydges, attracted over 185 attendees. Guests were treated to a delicious two-course lunch alongside insights on how our region is tracking, where our opportunities lie and what we have done well in the past. Mr Salt’s specialty lies in tracking global mega trends and his presentation included conversations around business in the Asian century, managing generational change and what jobs and customers of the future may look like. He has appeared on The Project, 60 Minutes, SBS Insight and Lateline with the media and global business holding his conclusions and recommendations in high regard. Mr Salt confirmed that our region had benefited enormously from ‘opportunities landing in our lap’ after the 2010 federal election, in particular the expansion of a university presence and a training hospital to encourage a shift in demographics. This has resulted in Port Macquarie no longer being regarded as ‘God’s waiting room’, with an increased cohort of young people, which Mr Salt credited with changing the energy of the town. A growth in cultural influences was also identified as contributing to the vibrancy and diversity of our communities and finding ways to bring inclusive experiences into our society has the potential to create more authentic relationships between organisations and the wider community. According to Mr Salt, faith in religious institutions, corporations and the government was on the decline, however, this news was buoyed by a growing sense of community and a healthy level of volunteering from locals. The event closed on a positive note with Mr Salt stating, “The single best thing any community can do, is to develop and discuss a future vision to, say, 2030 and 2050. A community united in it’s direction is easier and more efficient to govern and manage, leading to a better quality of life for residents”.